Apple on Tuesday released iOS 11.3.1, an incremental update to the iOS 11.3 operating system with a pretty major bug fix. 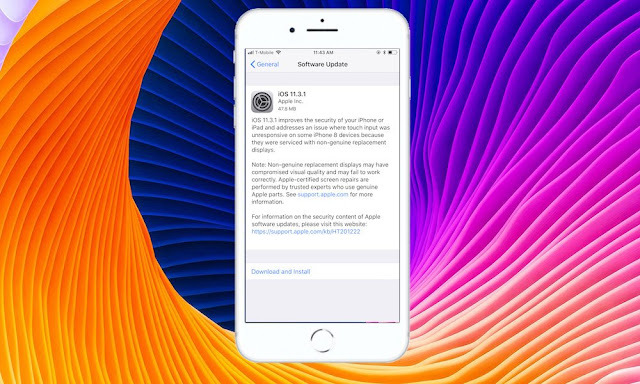 It’s a relatively small update to Apple’s mobile operating system, but it introduces a number of important bug patches and other under-the-hood changes. Chief among those is a fix for an issue that disabled touch functionality for iPhone 8 and 8 Plus devices that were repaired by a third-party vendor using aftermarket parts. The bug was discovered after users found that iOS 11.3 killed touch responsiveness on their devices. At the time, media outlets reported that “thousands” of iPhone 8 handsets that had been repaired using aftermarket display panels were impacted. Apparently, the issue was tied to a small microchip embedded in the display. While some users thought it might have been an intended move on Apple’s part to discourage third-party repairs, it now appears that it was the result of a bug. While Apple did fix the issue in iOS 11.3.1, the firm added a note urging users to only use authorized service providers and genuine Apple parts. iOS 11.3 itself, released to the public last month, added a slew of new features to iOS. They included the promised Battery Health feature and an option to disable performance throttling, as well as new Animoji, Business Chat for Messages, and updates to other native applications. iOS 11.3.1 should be available as a free over-the-air update to all users with an eligible device. It can be downloaded by going to Settings > General > Software Update.